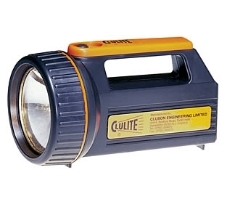 Clulite Classic Torch. Rechargeable, economical torch with a powerful spot beam. It is lightweight, compact and comfortable in the palm of your hand, but robust to withstand the hardest knocks. Complete with a mains charger.